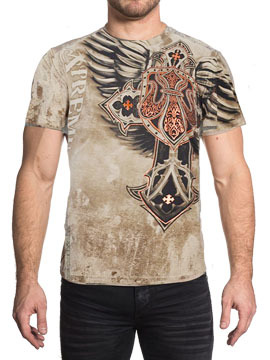 Xtreme Couture Lockdown mens short sleeve crew neck t-shirt features an ornate celtic cross, feather angel wings, medieval fleur shield, ornate filigree accented in gold foil on one side of the chest. The back features Xtreme Couture logo with a large ornate cross, medieval shield, fleur surrounded by a large pair of feather angel wings, decorative filigree accented in gold foil. 100% cotton, light weight, slim fit. Garment washed with silicon wash for soft feel. Color: sand.